Don’t let anyone cause you to doubt your value! It’s been quiet around here. Cue the crickets, right? I know, it’ crazy. I have missed chatting with you all. Do you even know how much you have blessed me by reaching out to check on us? You truly have! Mostly it’s been quiet around here because the priority has been on getting the house ready for the settlement. As you’d imagine, or as you already know from your own experience, there are a ton of tiny details that need our attention and are consuming our energy. Selling a house is not for sissies! But that isn’t really what has been weighing on me. I’ve allowed small voices to let doubt and fear creep into my head and my heart. I’ve hinted in past posts and on Periscope that I’ve long held back on sharing and teaching because of my own lack of self-confidence. A few of weeks ago, those small doubts were exploited and the result was a loss of my voice and a questioning of my place in the big scheme of things. Where and how to tell my story, and whether it matters to anyone but me. It’s time to get out of the funk! Easier said than done sometimes, isn’t it? I won’t tell you that you can or should snap right out of it, because I don’t know that to be true. Getting back up after stumbling takes effort and intention. I will share with you what I am learning on this journey. Know who your cheerleaders are. The first person I turn to is my husband. He’s my biggest supporter and encourager. He knows my daily struggles and frustrations as well as my big and small dreams. When I get quiet, he’s the first person who will notice. My sisters and girlfriends. I didn’t grow up with many girl friends because I had my sisters, but now as an adult living far from immediate family, I also lean on good girlfriends who are sisters in Christ. They can ground me in truth and sit in the muddy puddle with me. Voxer definitely keeps me connected to those whose voices I need to hear, especially when I need to drown out the doubts and doubters. Community! I would love to say that I have great local community that I turn to, but that wouldn’t be the complete truth. I have very few close friends whom I trust completely and depend on dearly to speak life and point to truth. However, where local community is lacking, God has blessed me with an amazing community of like-minded women connected through the internet. Some mock that, they are part of the small doubting voices, because those of us blessed by this fellowship know that it continues far beyond our computer screens. We are invested in each other’s lives and well-being. I won’t make that smaller than the huge impact that it is. I count myself blessed to hear encouragement from women like Amy(who is brilliant at walking beside me even when she doesn’t realize it), Tabitha(who is not only a friend but a mentor for using my blog smartly to the glory of God), Amy(who keeps me laughing and knows how important it is to keep it REAL), MacKenzie(who in the midst of the REAL is great at centering me back at God’s word), and Crystal(whose motivation gets me more excited than overwhelmed, which says A LOT) and artists like Joey(who knows the value of grace and kindness) and Erika(who shares in my fight against creative second-guessing). These ladies have used their platforms to allow us to connect with each other. When I’m watching their scopes, I have so much fun chatting with you all! You’ve all become part of my story. Get grounded in His truth about your worth! When we listen to the doubts and ‘haters’ it’s easy to think that we are not enough. That to have worth we must do, accomplish, strive, and achieve. We start to feel that our story isn’t big enough, our ideas aren’t unique enough, our talents aren’t polished enough. God’s word says we are enough because we are His. I truly believe that God has given each of us a beautiful (and messy) life to live, and that the trials that we walk through can be used to help edify someone who needs to hear, see, read the story of someone a few steps further down that road. That is why our story matters! Each and every one of us needs to speak our story, because while some parts may seem the same, we have a unique perspective that someone else out there is searching for… to help them learn how to tell their own story. Do you feel a longing to share your story? Maybe it’s a blog you’ve been wanting to start, or a journal you’d like to keep, or a friend you’ve been wanting to reach out to and confide in. 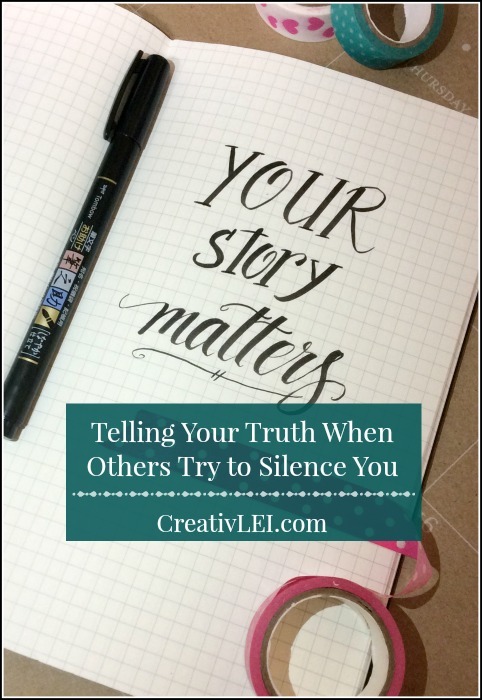 I want to tell you that your story matters! 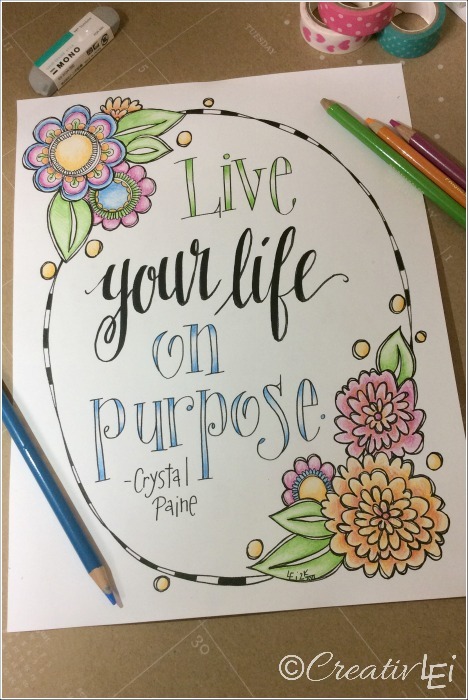 Download a copy of the printable quote and coloring page in this post, with a popular quote from Crystal of MoneySavingMom.com and my doodles and lettering. There is a black and white page for you to color, and a colored copy ready to frame or laminate. I’m adding the colored version to a dashboard for my traveler’s notebook. Entering your email allows me to send the download via encrypted link for your personal printing and use. Links expire after 3 days/4 downloads (whichever comes first). You will be subscribed to a newsletter list that keeps you informed of any new downloadable pages and products (not a weekly mailing). You may unsubscribe at any time this information no longer interests you. Hello~ I just recently found your blog and I have been going through your series on “Love your Lettering”. It has been sooo very helpful for me and I have enjoyed it very very much. I have realized recently, that although I am not skilled in this area of Lettering, it is something I really enjoy. The only problem is that I have ZERO creativity and I do not have an artistic bone in my body! But… when I came to your series, you have done such a great job and I am so thankful for the rules of lettering that you put in during the periscope. it has been such a help to me and I was just telling my husband last night how I was SO very thankful to beable to find this series and how well you were teaching it. Part of the reason that the timing of this has been a blessing is that we are moving to Australia in a few months and I won’t be able to take much with me… BUT 🙂 I think i can take a notebook and a few pens and keep myself busy during odd and random down time that is sure to come up. So – MANY MANY thanks! We don’t have tons of money to spend and so to beable to do this course for free has really been a blessing to me as I have four kids and no way of learning this skill any other way. I do hope that the Lord strengthens you and encourages your heart according to his Word and that you will find your heart comforted as you look to the Lord Jesus Christ as both Savior and Lord. It blesses me so much to hear feedback like this. It also affirms what I believe God called me to share. I do hope that you unlock creativity that you didn’t realize was already within you! God’s blessings on your upcoming journey, too! What an adventure. Thank you so much for including me. Thank you for your wise words and encouragement. As I navigate through my life, and attempt to begin my own blog, I appreciate women like you who are transparent and godly. Thank you, Debra. It is because of women who shared before me, that I’m learning to be more bold. I do hope you enjoy this adventure! Thank you for continuing to encourage me, Patti. Thank you so much for the encouragement, Keelie. Lisa, could you email me what it would cost to have you create a coloring page for me? I am writing a book titled Revealing Your Treasures Hidden in Darkness, to encourage women to believe they have a God given identity, purpose and worth following a difficult life circumstance/ season. I plan to lead workshops and give them packets and it would be awesome to have a coloring page included. I envision it as a treasure chest in the dark, with large colored jewels shining inside marked Identity, Value, Dream, Hope, Believe, Purpose, Giftsm Calling. Thank you, Karen. I will email you. I’m very interested in coordinating with you. thanks, Stacy. I hope you enjoy it! Hi Lisa, after reading your post I must admit I wanted to jump on a plane and just give you a huge hug and chat over Starbucks of course 😂😂. You are such a kind God loving woman. I see that in you so know that it shows in your scopes and your words. I can also see that you are timid, which is exactly what bullies will feed on. I love your scopes and your teachings. God has given you such a wonderful gift and the enemy will use anyone to discourage you. So please stand strong get your armor on and put up your sword. Charrrgggeeeee. Lol I miss you. I know if we lived locally we would be great hang out buddies. Know that you are loved and most of all missed and respected. Gweny, you greatly bless me. I’ll be back on periscope very soon, it’s just a little noisy here with everyone home for the snow. 😉 I so appreciate your words of encouragement! For some reason I can’t get the page to print. Joan, I’m having a problem matching your email so that I can resend the link. If you’d please email me at creativleimade@gmail.com with the address that you signed up with. I can resend the email to you. I want to write a book about The very real journey that I’ve walked with Him that is slowly and completely changing this heart’s longing to be obliterated so He is blatantly present for this world to know He is Lord. I’m 49 and life has been miraculous yet He has been compassionate to want me this much. I love Him because He is Lord. I am praying He will open the door to do this if it’s His will. I love reading your stuff…. It’s His voice to me because it often times will confirm what I’ve already been told. Thank you for being loving and giving for in you I see my Savior. Hi Corena, I’m sending a copy of your beautiful comment to Crystal. Thank you so much for sharing your heart here. Hello, Lisa! I wanted to get the beautiful colouring page but there seems to be a problem because I’ve received the subscription confirmation email twice but no link to the download. Could you please look into this? Thank you very much. Hi Monika, I’ve emailed you the link. Thanks so much for your patience and understanding! Hi Kelly, I saw your message and forwarded the link to you. I really appreciate your patience. You’ve definitely signed up correctly, I’m trying to troubleshoot why some of the links aren’t reaching some of you. Hi Ellie, found and forwarded it to you. Thanks for understanding. Hi DeAnna, I’m working on having the issue resolved. I’ll be sending out another message tomorrow to be sure the links have gone out. Hi Lynn, I’ve tried to send it to you, let me know if it has come to your inbox. Thanks! I couldn’t download the coloring page. Could you help with that? I am on day 3 of Love your lettering and am really enjoying it. It is amazing how 15-20 minutes a day of creativity can brighten your day. Thanks for offering this class! Lisa, I was unable to download the quote and coloring page. It really jumped out at me. Thanks for the help. Hi Mary, I’m trying to find you registration so that I can forward the link to you. Please email me at creativleimade@gmail.com to verify which address I should be looking for. Thanks so much for understanding. Thanks so much for offering the coloring page. Mine didn’t come either. Thanks! Hi Paige, I sent you the link I found for you. Thanks for your patience. Lisa, I wasn’t able to download the free coloring page. I signed up for your blog and never got a confirmation. Could you help me with this? I tried yesterday and today. Thanks! Hi Lynn, I just forwarded the email to you. 🙂 Thanks! Lisa – same problem as above – confirmation without the link for the coloring page. Found it and forwarded it to you. Thanks for your patience. Hi Ruth, found and sent it to you. Hello! I signed up for the email list, but haven’t received my link for the download. I love your coloring page! I am trying to focus on living my life on purpose, so I grabbed a copy. It will go on my wall next to my computer where I write my blog. It’s good to meet you. I hopped over from Crystal Paine’s site. Thank you, Janet. I hope the link has come through okay for you. What a blessing to know that I get to be part of your story while you write, too. Just started reading your blog and I am obsessed. I get this great feeling when reading your website. Your coloring book is great! I will definitely pick up a copy! You know how sometimes you read something you just NEEDED to hear at that very moment? That is what your website has done for me many times! I have recently started a blog and many people have told me I shouldn’t. Honestly I think it maybe my calling. I am still afraid to tell people that tho. Thanks for being there for this mom of 2 in Cincinnati, Ohio! Your word and blog mean a lot! Alison, thank you so much for your affirming words. It really does mean a lot to me. Don’t let anyone get you down, if He is calling you to share words, don’t deny yourself (and those who need your words) that blessing. Be bold, friend. I’m having the same problem as everyone above. Thanks, Bev. I’m working on fixing it. By tomorrow you all should have it. Could you please send me the link/file, too? I never got a link. Thanks! The issue should clear tonight. I will send another email tomorrow to ensure you all have received the page. I had to come back to this post and read it again. This is a powerful message. It a message I very much needed to hear. I read this blog post today, a few months after it was written, but it was in God’s timing! Thank you so much for your honesty and transparency. Your words truly ministered to me. I cried as I read this. I had just told my hubby today that I wanted to give up on ministry, as I’ve been feeling so empty, so worthless. I have always felt a call to write but the thoughts of writing a blog totally intimidate me! And I’ve been dabbling in Bible art journaling, but because the friends I am around are so talented and creative, I end up feeling extremely inept and inadequate. I usually come away feeling like the girl who isn’t good enough to be picked for the team. Your writing and teaching are gifts from God. Don’t let the enemy silence you. You have a divine calling! Keep using your gifts to encourage others! Keep doing YOU! God bless you! And thank you for the free class and downloads. Pamm, thank you so much for your affirming words. I do hope that you will quiet that lying voice that tells you that your friends are more creative. You have something to add to your bible that no one else could possibly do. It is your insights, your revelations, and your handwriting that your children will want to peek into some day. Don’t be afraid to get a little ‘messy’ in the Word. It’s my pleasure to be here and share with you all. Lisa, I am just in tears as I read this post, I am so able to identify with what you are sharing. God has been leading me in areas that I am so unsure of, so feeling like not enough and just like I would be adding to what so many others are already doing so much better than me. But once again those words of my own story mattering hits me deep. Because of a birth trauma that ended the life of my child and almost my own I have gone from being an extrovert to an introvert. The recovering journey from the deep damage has been such an interesting one. Silence is a trigger for me since childhood and so I totally relate to how that can mess with a person’s mind. Thanks for sharing, for being vulnerable, real, and just plain old honest, so refreshing! Makes my journey feel safer to move forward in. Heidi, ((hugs)) thank you so much for sharing your story with me, that really means a lot. I’m thankful that these words could encourage you. Praying for your bravery and boldness on this journey, I know He will use your story to minister to others.